I probably should have posted about this when I was actually doing it. But C’est la vie. Anyway I had been messing around with some Arduino stuff a while back, and got pretty far but never finished a project. Other things came up so I shelved it all. Then we got a kitten and I thought it would be fun to be able to play with the kitten while I was out of the house. So I came up with the idea for a remote control robot with a kitten toy attached to it that you could control from a web page. Already having an Arduino, the natural choice was to extend what I had. Now being, at least what I consider to be, a fairly adept programmer, I was not worried about the software side of things. However I was also not worried about the hardware side of things… This was stupid. Since the control side of the hardware was merely 3 boards that fit neatly together, I started by focusing on the chassis construction. 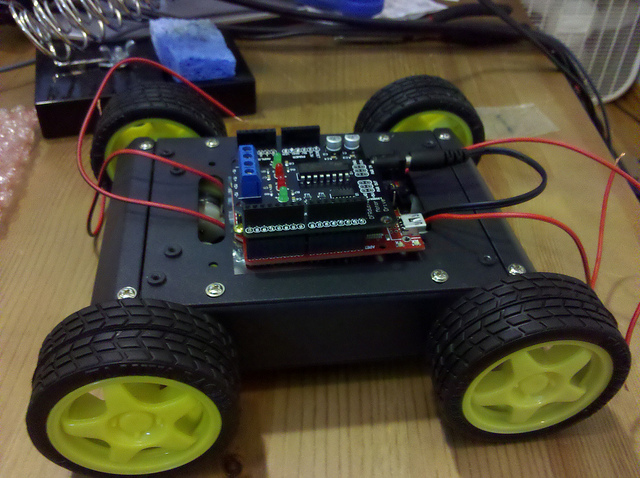 Now I went into this wanting it to be a fun learning project, not just a robot in a kit. And boy did I get more than I bargained for. The Chassis kit consisted of a 3 zip-lock bags. 1 contained several tiny metal pieces that clearly were meant to be the chassis frame. 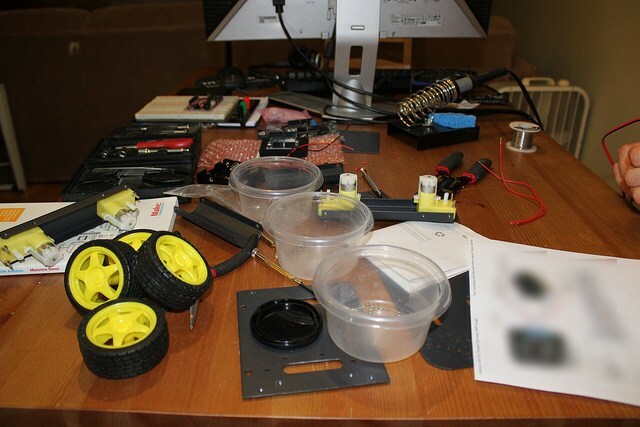 1 contained assorted screws and other hardware necessary for assembly, and the last contained 4 small-ish servos. I’ve done some electronics stuff, and we had covered circuits in my college physics classes, but any useful knowledge from those past experiences fell out of my head when I was presented with this unorganized, unstructured bag of parts. There was no manual, no instructions, no numbered pieces. Just a bag of constituent components that could, in the right and knowledgeable hands, be assembled into a robot chassis. Though truth be told they could also be assembled into a doomsday machine for all I knew. Each seemed equally possible from where I stood. So I dug in. Not knowing where in particular to start I began sizing up the metal parts that would make up the frame. Fitting them together didn’t take long to figure out. I ended up assembling them, promptly realizing that the order I did it in presented me with problems, and reassembling it again, several times in fact, until I found the optimal method. Attaching the servos again made me disassemble and reassemble the frame (with the frame fully assembled the space was too small for me to work in to attach the servos). 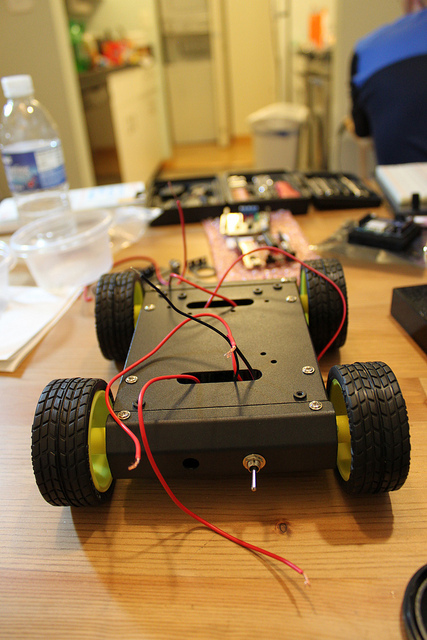 So Finally, after longer then I’d like to admit, I had the chassis assembled and servo’s installed inside it. The design I had come up with was intended to keep things as simple as possible. Each motor driver had a + and – terminal on the shield, thus I only wanted 4 wires total coming out of the chassis bound for the control board. I would hook up the 2 motors on a given side in series. This kept wire clutter to a minimum, and kept everything as simple as can be. I could regale you with tales of soldering through the plastic that held the leads, and cutting the wires too short after one end was already soldered, or how I realized the leads on the servo’s were thin cheap and breakable, or how I forgot which lead was + and which was – on the servo because one was the revere of the other. 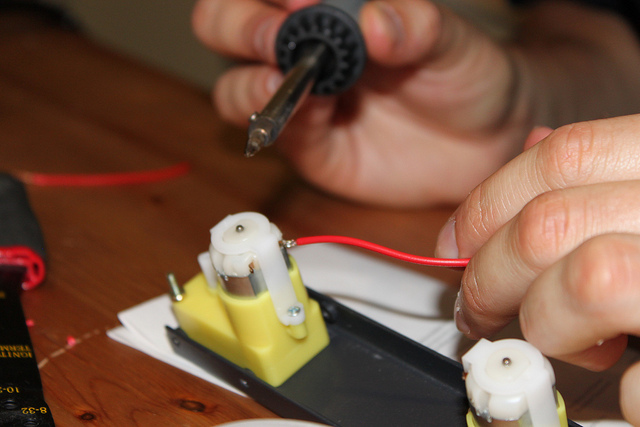 But I won’t, suffice it to say it’s only the 3rd time I’ve soldered something. And I learned a lot. At this point I had been at this for HOURS. It was a monster session. I was burnt out. My girlfriend who had been by my side for most of it, was passed out on the couch at this point, stirring only when I would get a face full of solder smoke and make a pained nasal sound. I was DONE but couldn’t go to sleep without seeing it move. Actually hooking up the logic boards was not an option so I just taped a 9V battery to the chassis and connected the leads to it. The results were less then spectacular. While holding it in the air, the wheels barely moved, and when sitting on the ground it couldn’t overcome friction it seemed. Blurry-eyed, frustrated, and tired. I called it quits for the night and passed out. This entry was posted in Arduino, Uncategorized and tagged Arduino on June 30, 2011 by Wavesonics.